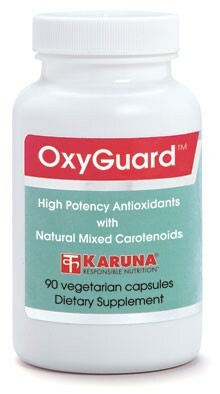 OxyGuard provides a broad and synergistic spectrum of antioxidant activity. Antioxidants work best in combination, helping to regenerate one another. Combinations also avoid the potential for depletion of some antioxidants, particularly carotenoids, which may occur if a balanced mix is not used. 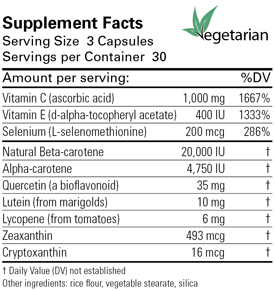 Vitamins C, E, and selenium appear to be particularly synergistic. The addition of natural mixed carotenoids, and quercetin further improves the radical quenching effect of OxyGuard. Refer to About…Carotenoids, About…Vitamin C and E-400. OxyGuard's formula includes natural-source beta carotene, alpha carotene, lutein, lycopene and other carotenoids balanced much as they occur in a diet of natural foods. OxyGuard contains a highly bioavailable form of selenium (J Nutr Sci Vitaminol 1999;45:119-28) that has been associated with impressive health protective effects in human studies (JAMA 1996;276:1957-63; Eur J Cancer 2000;36:694-709). Quercetin, an antioxidant from the flavonoid family, increases the free radical scavenging ability of the blood (Free Radic Res 1999;31 Suppl:S75-80) and is associated with coronary vascular health (BMJ 1996;312:478-81). Suggested use for adults: Three capsules daily, taken with meals, or as directed.